The Nine Doors of Midgard are the gateways to self-transformation and mastery through the Runes. This complete course of study and practice has been used by the initiates of the Rune-Gild since 1980. Long out-of-print to the wider public and difficult to obtain, it is now being made available in a completely revised and updated fifth edition. ?The Runic Tradition represents a whole school of inner work as ancient as any other and with the added importance that it is the ancestral, or natural, path for folks of Germanic (English, German, Dutch, and Scandinavian) background. 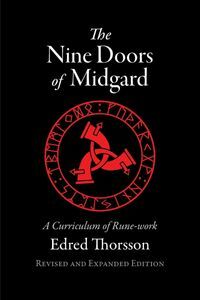 The graded steps of The Nine Doors of Midgard are the only curriculum to take a systematic and traditional approach to inner Rune-work. ?Through nine “lessons” the book takes the Rune-worker from a stage in which no previous knowledge of Runes or esoteric work is assumed to a high level of initiation. ?